The spider-powered teen hero Miles Morales swings through the city stopping villains as he goes. Kids can imagine suiting up like the wall-crawling hero Miles Morales with the Miles Morales Hero Mask. 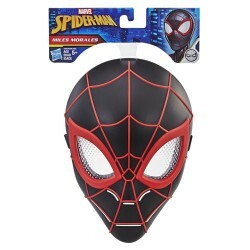 The eye lenses feature dotted graphic detailing inspired by the appearance of Miles Morales' mask. Plus, the mask includes a flexible band that fits most kids, so they can imagine slinging webs alongside Miles! Superpowers not included.